Founded by designer-maker Jack Havelock Bailey, Havelock Studio focuses on objects and furniture rooted in concept and purpose. When we first spoke to Jack, we connected with his belief that the enjoyment of life can be improved with simple, beautiful and functional design. This bespoke origami trivet is the result of our collaboration, each piece handmade in Jack’s Kent workshop. 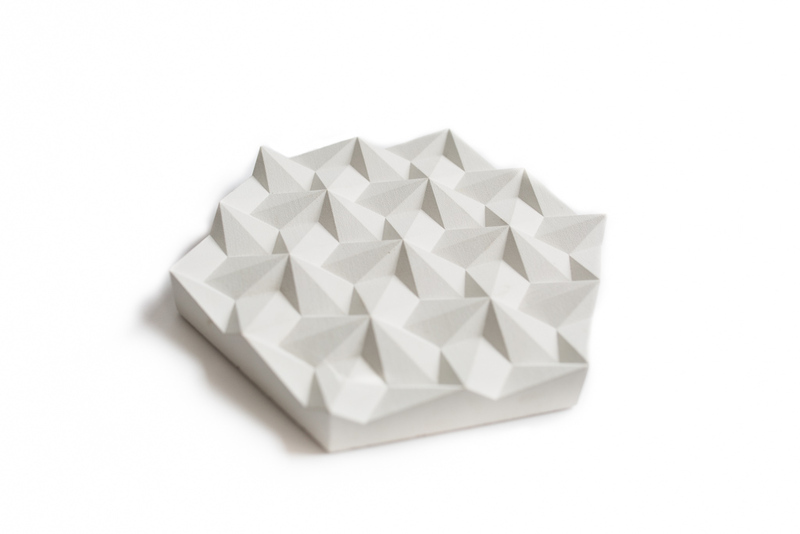 Inspired by folded paper patterns and designed to be a graphic and intriguing object perfect for protecting surfaces from hot pans or dishes, each trivet is cast by hand using white cement and silica sand. 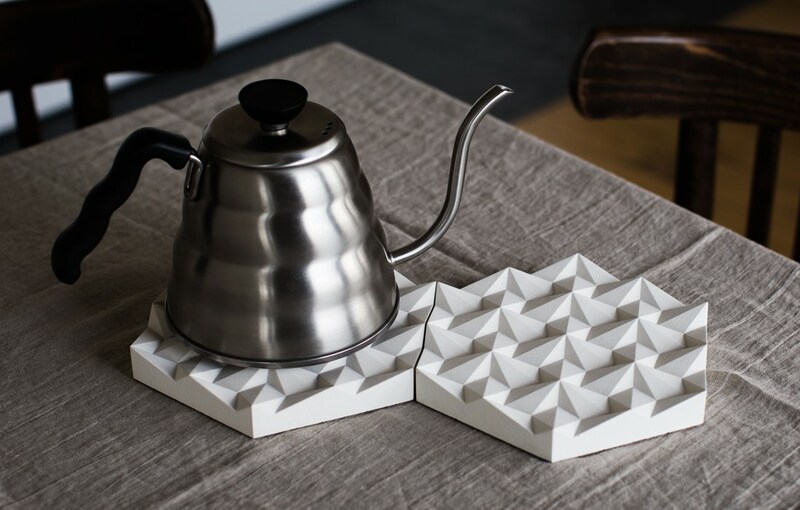 The trivets tessellate together almost seamlessly, making an extendable surface for multiple pans. The concrete is sealed to prevent staining and to allow for easy cleaning, while the cork base protects your surfaces. 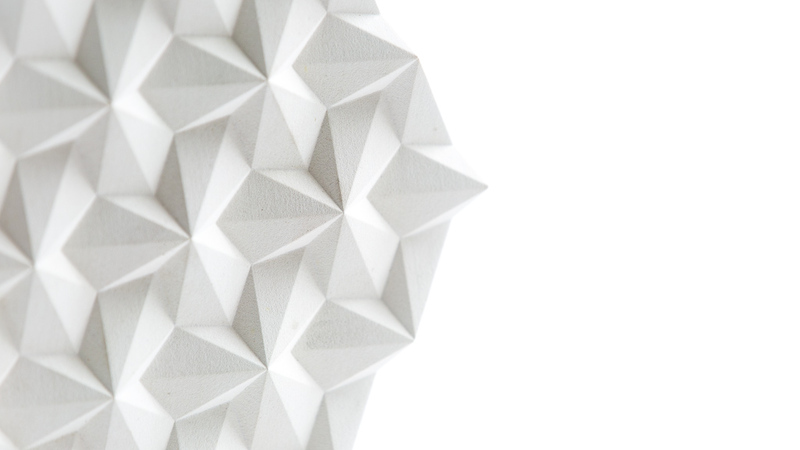 We love how the origami-inspired pattern catches the light, making for an almost architectural piece that looks great used as a trivet or simply left on the table as a beautiful centrepiece. Please note that variations and imperfections will occur, adding to the beauty and integrity of the handmade items. Currently the trivets are made to order and will take a maximum of 2 weeks to be dispatched. How do I contribute to the magazine and/or online editorial? We have an established team but are always open to new collaborations. If you have a story to tell, please send your idea and portfolio to editorial@atthetable.co.uk. I have a question regarding the shop and/or my order. Who do I contact? Please email info@atthetable.co.uk with your question and order number and we will contact you as soon as possible. Unless otherwise stated, orders ship in 1-3 business days from England via Royal Mail for customers in the UK, and via Royal Air Mail for customers outside the UK. If you need a product by a specific date or want your order to be trackable, please email info@atthetable.co.uk before placing your order. How do I find out when tickets go on sale for your events? To be the first to find out about our events, sign up to our newsletter via this site. Subscribers receive the ticket link prior to anyone else. We then post on Twitter, Instagram and Facebook so keep an eye on your preferred platform for news. Do you work with brands? Quality content is at the centre of everything we do. We work regularly with brands, creating bespoke content and helping to grow engaged communities. If you’d like to work with us please email bespoke@atthetable.co.uk. We have a dedicated in-house team and have built our own platform. Do get in touch if you are looking for bespoke web development services. Thank you for shopping with At The Table Ltd. Please familiarise yourself with the below before placing an order. We are currently accepting payment via debit and credit card. To use a debit or credit card, simply enter your card information when prompted, and your account will be securely charged. Tickets to our events and talks are non-refundable. However, you are welcome to transfer tickets to friends and family if you are unable to attend an event. Simply notify us on info@atthetable.co.uk. At this time, we also do not offer refunds or exchanges for products purchased via our website. If the product gets damaged in the post, please contact us at info@atthetable.co.uk with images of the product and packaging. You are welcome to use our product photos on your blog or site as needed. If you do, please link back to our homepage or the product page. Photos may not be used for any other purpose and may not be altered. All content on this website is copyrighted. High resolution product photos are available upon request. We will try our best to fulfil every order as specified in our terms, but delays and cancellations may occur for reasons beyond our control. We reserve the right to cancel any orders for any reason, refunding our customers for the full amount immediately. The At The Table website, At The Table Ltd and material relating to information, products and services (or to third party information, products and services), is provided ‘as is’ without any representation or endorsement made and without warranty of any kind whether express or implied, including but not limited to the implied warranties of satisfactory quality, fitness for a particular purpose, non-infringement, compatibility, security and accuracy. We do not warrant that the functions contained in the material contained in this site will be uninterrupted or error free, that defects will be corrected, or that this site or the server that make it available are free of viruses or represent the full functionality, accuracy, reliability of the materials. In no event will we be liable for any loss or damage including, without limitation, indirect or consequential loss or damage, or any loss or damage whatsoever arising from use or loss of use of, data, or profits, arising out of or in connection with the use of the At The Table Ltd t/a At The Table website. These Terms and Conditions shall be governed by and construed in accordance with the laws of England and Wales. Any dispute arising under these Terms and Conditions shall be subject to the exclusive jurisdiction of the courts of England and Wales At The Table Ltd is registered in England and Wales Reg No 09899566. Registered Offices: 16 Nickleby House, George Row, London SE16 4UW. At The Table is committed to protecting your privacy. We will use the information that we collect about you in accordance with the Data Protection Act 1998 and the Privacy and Electronic Communications Regulations 2003. Our use of your personal data will always have a lawful basis, either because it is necessary to complete a booking or purchase, because you have consented to our use of your personal data (e.g. by subscribing to emails), or because it is in our legitimate interests. We will only share your information with companies if necessary to deliver services on our behalf. For example third-party payment processors, and other third parties to provide our sites and fulfil your requests, and as otherwise consented to by you or as permitted by applicable law. You give us your information when you book an event, make a purchase from our shop or sign up to our newsletter. We use Stripe to process card transactions and do not store credit card details. We keep a record of the emails we send you, and we may track whether you receive or open them so we can make sure we are sending you the most relevant information. We may then track any subsequent actions online. Like most websites, we receive and store certain details whenever you use the At The Table website. We use “cookies” to help us make our site – and the way you might use it – better. There is more information on this below. We aim to be clear when we collect your data and not to do anything you wouldn’t reasonably expect. If you make a purchase or book an event we usually collect your name and contact details and your bank or credit card information (if making a transaction via Stripe). We will include opt-out instructions in any marketing communications you receive from us. We use Stripe to process payments. Stripe adheres to the standards set by PCI-DSS as managed by the PCI Security Standards Council, which is a joint effort of brands like Visa, MasterCard, American Express and Discover. Third-party services In general, the third-party providers used by us will only collect, use and disclose your information to the extent necessary to allow them to perform the services they provide to us. This cookie is used to prevent certain types of attacks known as ‘cross-site request forgery’ and also prevents other malicious users from hijacking or imitating a genuine users session. This cookie is set on any page when a visitor arrives. we use this to enable certain functionality when you visit our site such as our shopping cart and checkout process. Stripe uses these cookies to remember who you are and to enable At The Table to process payments without storing any credit card information on its own servers. Google Analytics Google Analytics is a third-party service that collects standard internet log information about our website visitors. This includes number of visitors to a specific page, whether they are accessing the page via laptop or mobile, and general demographic data. Google Analytics paints a useful picture of who visits our website and how people find out about us online. We do not use Google Analytics to identify anyone. We use social media to broadcast messages and updates about events and news. On occasion we may reply to comments or questions you make to us on social media platforms. Depending on your settings or the privacy policies social media and messaging services like Facebook, Instagram or Twitter, you might give the third party permission to access information from those accounts or services. You can unsubscribe from our mailing list at any time by clicking the unsubscribe link at the bottom of the email, or by contacting us at info@atthetable.co.uk. Questions and Contact Information If you would like to: access, correct, amend or delete any personal information we have about you, register a complaint, or simply want more information contact our Privacy Compliance Officer at info@atthetable.co.uk or by mail at At The Table, 16 Nickleby House, George Row, London, SE16 4UW.